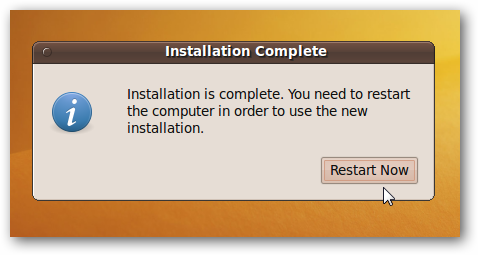 You have a new computer that came with Windows 7 pre-installed on it, and you want to create a dual boot system so you can run Ubuntu Linux as well. 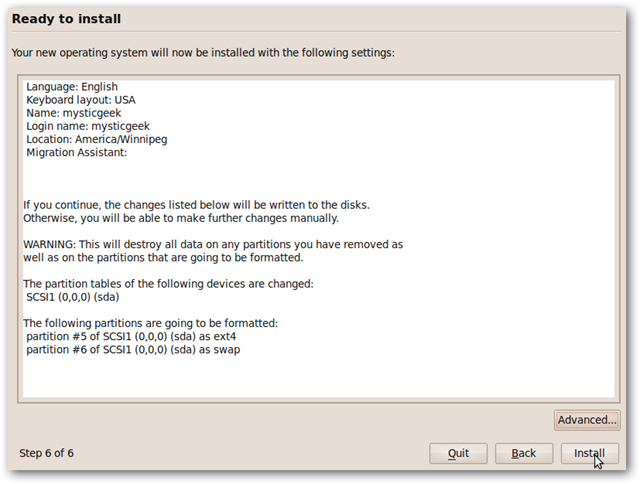 Here we take you through the process to install Ubuntu on your pre-installed Windows 7 machine. 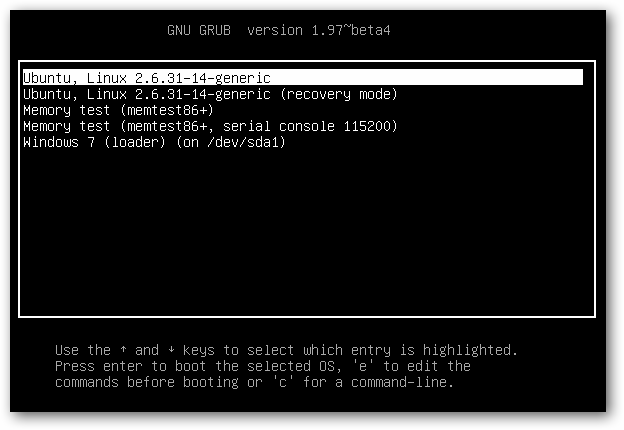 Here we will set up a basic dual boot system with the Ubuntu 9.10 disc that will create GRUB as your boot loader. On the Window 7 machine pop in the Ubuntu disc and boot from it. 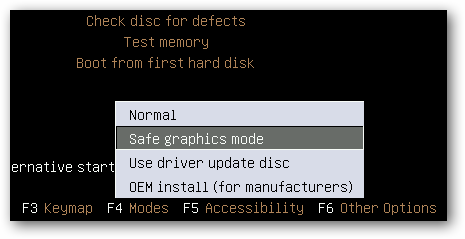 If you experience a problem with the graphics with Ubuntu not displaying correctly, go back to the start screen, hit F4 and select Safe graphics mode. Continue through the installation steps by selecting your language, time zone, and keyboard layout. When you get to the following screen (step 4 of 6), the easiest method for beginners is to select the first option– Install them side by side, choosing between them each startup. On the first bar you’ll see is the entire Windows 7 partition. Then on the second bar, you can slide it up or down to specify the amount of hard drive space you want for Ubuntu. 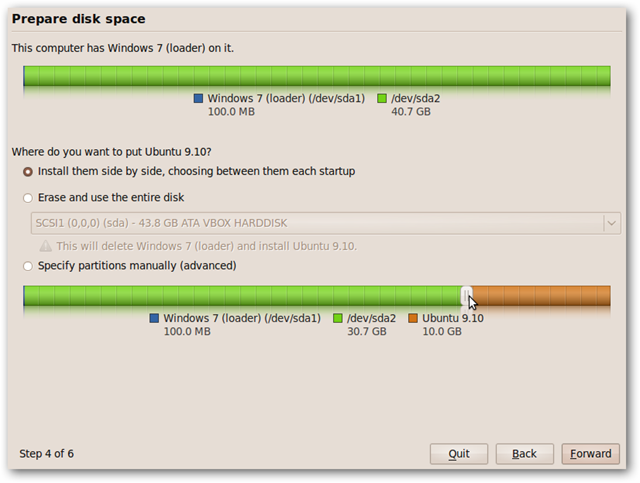 The green area represents the amount of space we’re leaving for Windows 7, and the brown is the space we’re allocating for Ubuntu.In this example we’re sliding it down to 10GB and leaving the rest for Windows. Click continue to the verification dialog box. 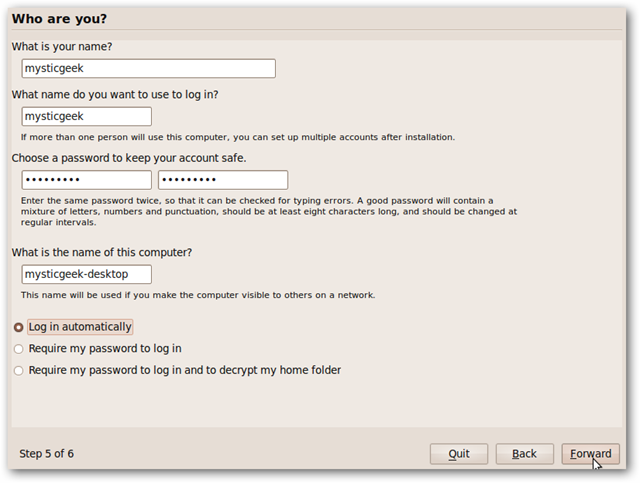 In the next step create your user name, password, and configure log in options. If everything looks good, go ahead and click Install. If you need to make any changes you can still go back and make them at this point. 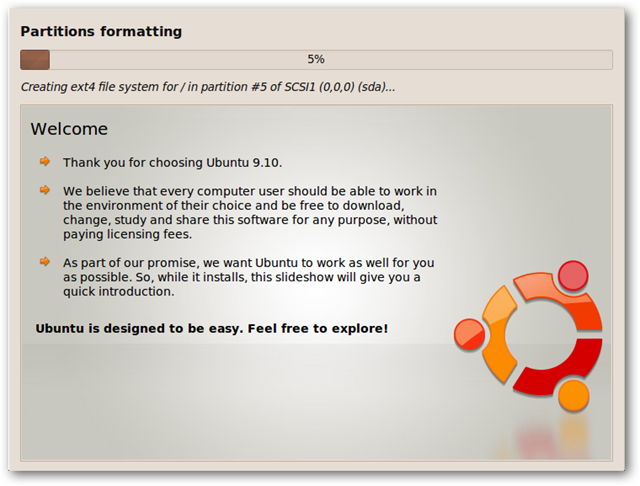 The installation will start showing a progress bar and display new features in Ubuntu 9.10. The amount of time it takes to install will vary from system to system, and once it’s complete, go ahead and restart the machine. When the machine reboots you’ll see the GRUB loader where you can boot to Ubuntu or Windows 7. One thing to point out in my experience with this method is when you first boot into Windows 7, Check Disk runs, then reboots and you need to choose the Windows 7 option again from the bootloader. 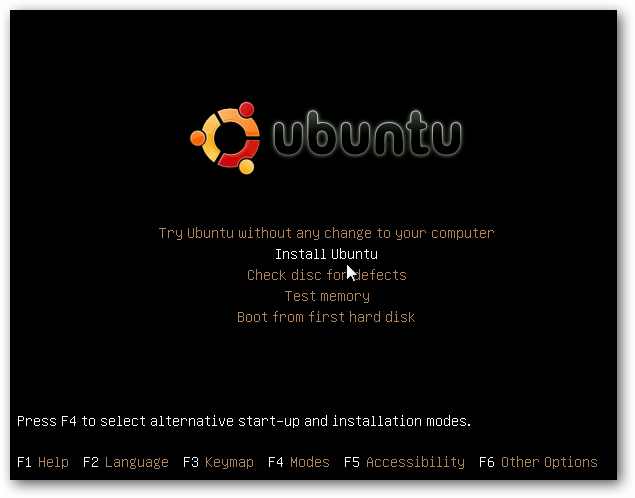 This should help get you started in enjoying a Windows 7 / Ubuntu Linux dual boot configuration. There are definitely other ways to get a Windows / Linux dual boot system, but if you want a quick method, so you can try out Ubuntu, this method works well.